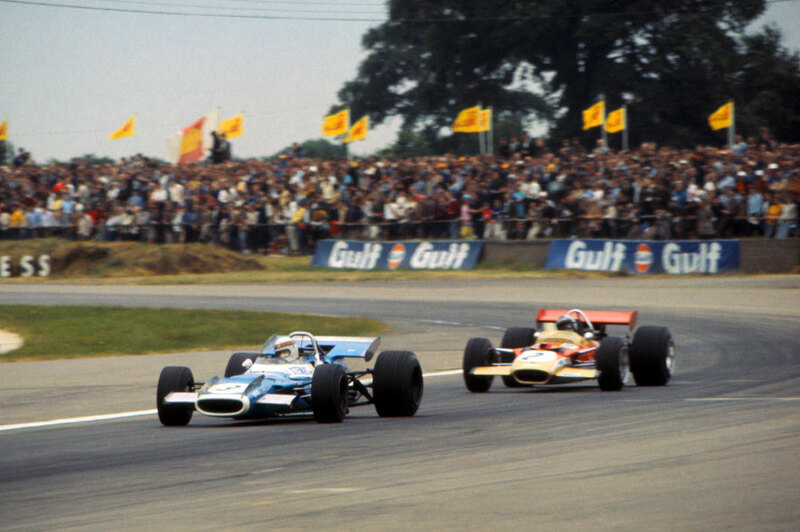 Jackie Stewart's fifth win in six races left him odds-on favourite for the championship, his victory at the British Grand Prix coming despite him crashing during practice and having to commandeer team-mate Jean-Pierre Beltoise's car. Stewart was following Piers Courage when the Englishman clipped a kerb and sent a small stone flying into Stewart's car, exploding his rear tyre. At 150mph he lost control and careered through three layers of chain-linked fencing. Despite that set-back, Stewart still took pole, but it was Jochen Rindt who got the better start, holding Stewart at bay for seven laps until he was passed. Rindt regained the lead on the 15th lap and stayed at the front until the 62nd lap when he had to pit as his rear wing started to sag and rub against a tyre and he needed the end plate ripped away. By the time he resumed Stewart's engine was starting to misfire and the gap between them quickly closed, but then Rindt had to head back to the pits for fuel and he was unable to close the gap for a second time. Jacky Ickz also had fuel problems, his engine spluttering to a stop on the last lap, but he had enough momentum to freewheel across the line to take second. Graham Hill, a distant second to Stewart in the championship, lost out on fourth place when he too had to stop to take on more fuel. Stewart's victory was all the more remarkable as it emerged he had driven most of the race without a clutch. "There was nothing to it but to go on changing gear by judging the engine revs precisely," he said. "It wasn't always quite right. On the 15th lap I missed a gear and Rindt charged past me into the lead." Stewart headed home from Silverstone with a massive lead in the drivers' championship - he had 45 points with Bruce McLaren a distant second on 17 points and Hill one further back.